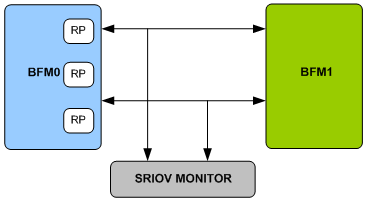 SRIOV Verification IP provides an smart way to verify the PCIE bi-directional bus. The SmartDV's SRIOV Verification IP is fully compliant with version 1.0/2.0/3.0/4.0/5.0 of the PCIE Specification, 1.0/1.1 of the SRIOV Specification and provides the following features. Supports PCIE Express specs 1.0/2.0/3.0/4.0/5.0. Supports PIPE, Serial, PCS/PMA, Low pin count and SerDes interface. Supports Full link speed and width negotiation up to 32 Lanes. Supports Automated Error Injections at all layers. Supports Checkers verify protocol timing checks and functional accuracy at each layer. Supports Queuing for 8 VCs with configurable depth. Supports Configurable TC to VC queue mapping. Supports for multiple Requestor / Completer applications, including user supplied applications. Supports User interface for direct TLP queuing and receipt. Supports Checks all TLPs for correct formation of headers, prefixes and ECRC. Supports Full DL state machines. Supports Checks all framing, LCRC, and lane rules. Supports Check all DLLP fields and formatting. Supports Interface to send / receive user defined DLLPs. Supports ASPM and Software controlled Power Management. Supports Automated Error Injections and checking. Supports Full LTSSM state machine. Supports SERDES model with digital clock recovery. Supports Speed and Link Width negotiation. Supports Upconfigure, polarity inversion, and lane-to-lane skew. Supports Configurable Spread Spectrum Clocking (SSC). Supports Gen 1 & 2 PCS, 8b/10b encoding. Supports Gen 3, 4 & 5 128/130 encoding. Supports Configurable timers and timeouts. Callbacks in Root complex,End point and monitor for user processing of data. SRIOV Verification IP comes with complete testsuite to test every feature of SRIOV and PCI Express specification. Functional coverage to cover all functionality of SRIOV and PCIE Root complex and End point. Supports for multiple instantiations to create complex verification environment. Faster testbench development and more complete verification of SRIOV and PCI Express designs. SmartDV's SRIOV Verification env contains following. Complete regression suite containing all the SRIOV testcases to certify SRIOV and PCI Express Root complex and End point.